I couldnt stop laughing, not in a bad way, I just found it entertaining. I have no real comments for this video except that it amused me. oH maN that was daDang alright! Love the ending with the board. Dude's got Skillz. 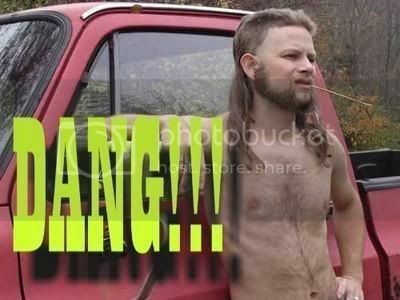 This reminds me of Johnny Knoxsville, maybe cuz he digs Willie and is from Tennessee. Okay here is the inside scoop. The Mullet was a joke. I had just happen to call him up that day for some recording and he just got the hair cut. I think he got it cut back to normal the next day or so. Ever since I knew he could ride a skateboard too I wanted to shoot boards and bikes. We had a blast shooting it. It took awhile to get the perfect music but after much deliberation and searching we settled on this one. If I am correct we shoot this film in April. It took awhile to get all the pieces together. There you have it......The Flat Truth!!! im also a skater, altho I specialize in miniramps. that mullet was crazy awesome, I kinda figured it was a joke. would also be funny to film flatlanding wearing a gigantic costume of some sort. like a barney the dinosouar full getup busting mc circles. that reminds me of Chad D riding as Sonic in Baco. They broke the mold with Jason Childers. That boy can ride! Just check out the new video section!!! I cut my hair into a mullet (back when I had a full head) for Mardi Gras '03. I wore a Lynyrd Skynyrd t-shirt and drank Natural Light all day. Good stuff. That is awesome. I remember BITD Freestylin' had a thing called "Dual is Cool." That is total soul. Here where I live all the skater children come in from the suburbs and skate all ove the city for the day and act rude to me and say things about bikes and mock me... It reminds me of a story I heard. Some people got on a boat to get away from rules and B.S. They sailed for a while and landed in a new place and said hey we can do what ever we want because there are no rules here (like no parents, coaches or jocks?) So all the boat people were grooving on the new digs. When all of a sudden they realized there were people already on this land they just discovered doing their own thing. So the Guys who had just come off the boat got belligerent. Some times the urge is just great resist making the same mistakes over again. Not that being hrassed by stupid kids is anythin on that level but they could just be happy with skating.